KB Members: You can extract the emails of front end KB members by marking the checkbox available corresponding to KB Members section. When it is marked, it further allows you to filter the members of their status. If Both is checked in Member Status, email addresses of both active and inactive members will be extracted. If Active is checked, email addresses of only active members will be extracted. If Inactive is checked, email addresses of only inactive members will be extracted. Comments: You can enable the corresponding box in this section to extract the email addresses of persons who have posted comments on knowledge base articles. 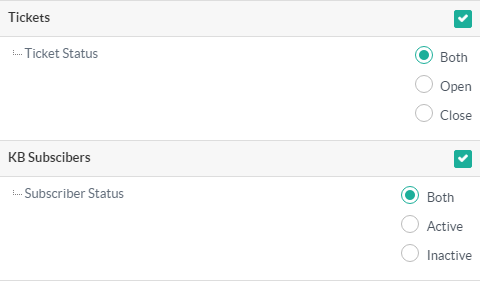 When the check box is marked, Comment Status filter is displayed which has three choices - Both, Pending and Approved. If Both is selected, email addresses of persons whose comments are either in pending or approved status will be extracted. If Pending is checked, the system will extract the email addresses of persons whose comments are in pending status. If Approved is checked, it will extract the email addresses of persons whose comments have been approved. Ticket: You can enable this section to extract the email addresses of persons who have submitted the questions in the form of tickets. When you mark this section for extraction, you can further filter the email addresses based on Ticket Status. If Both is checked, email addresses of persons whose tickets are either in open or closed state will be extracted. If Open is checked, it will extract the email addresses of persons whose tickets are in open state. If Close is checked, it will extract the email addresses only from closed tickets. KB Subscribers: You can enable this section to extract the email addresses of persons who are subscribed to the knowledge base. You can further filter the subscribers on the basis of their subscription status. If Both is checked in Subscriber Status, email addresses of both active and inactive subscribers will be extracted. If Active is checked, email addresses of only Active subscribers will be extracted. If Inactive is checked, email addresses of only inactive subscribers will be extracted. Category Subscribers: You can check this section to extract the email addresses of persons who are subscribed to knowledge base categories. 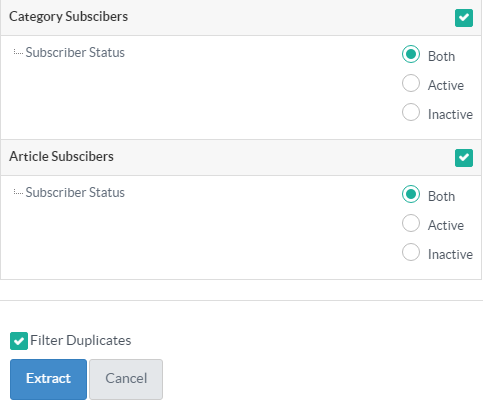 You can further filter the category subscribers on the basis of their subscription status. If Both is checked in Subscriber Status, email addresses of both active and inactive category subscribers will be extracted. If Active is checked, email addresses of only Active category subscribers will be extracted. If Inactive is checked, email addresses of only inactive category subscribers will be extracted. Article Subscriber: You can check this section to extract the email addresses of persons who are subscribed to knowledge base articles. You can further filter the article subscribers on the basis of their subscription status. If Both is checked in Subscriber Status, email addresses of both active and inactive article subscribers will be extracted. If Active is checked, email addresses of only Active article subscribers will be extracted. If Inactive is checked, email addresses of only inactive article subscribers will be extracted. Check All button would allow you to select all the sections in one go and Uncheck all button allows you to deselect the selected sections. Filter Duplicates: If the option is selected, it will remove the duplicate email addresses from the extracted list. 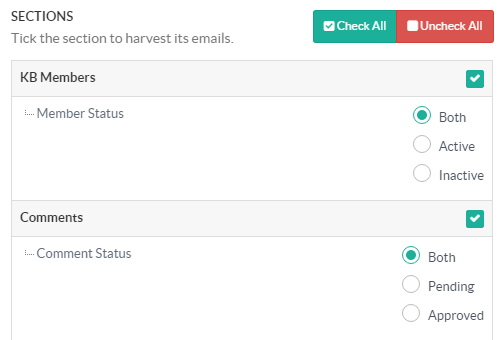 Click on Extract button to generate the list of email addresses or you can click on Cancel button to abandon the process of email harvesting. 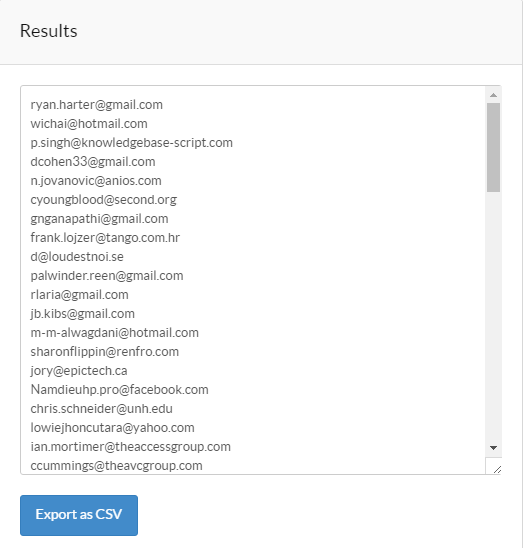 The results of harvesting email address will be displayed on the right side of the page as shown in the figure above. In case you want to export the result as CSV file, click on "Export as CSV" button.